Screenshot through the heart, and your group text's to blame. If you glanced at my camera roll a few years ago, there was about a 70/30 ratio of actual photos I took versus text screenshots: empirical evidence of countlessly annoying dating experiences. There were one-sided gray bubble columns from guys who were an unfortunate combo of clueless and horny; aggressively pretentious assertions about my taste in TV if I preferred The Simpsons over Futurama; and—the smallest demographic—guys I actually liked but couldn’t fully decode over text. I preserved conversations from each and every one of these men and sent them to my group chats, cueing the endless jokes, swapping of stories, and advice, sometimes solicited, sometimes not. The solace, as a single person, was that no matter how spectacularly awful a first date was, it could at least become a delightful horror story to light up my friends' phones. The downside? I had no idea what dating outside of my group chat's constant approval was actually like. Moreover, was it helping me at all? Obviously, roasting genuinely awful men with your closest friends is one of the greatest joys in life. But when it comes to truly figuring out if you vibe with someone, things can get tricky. 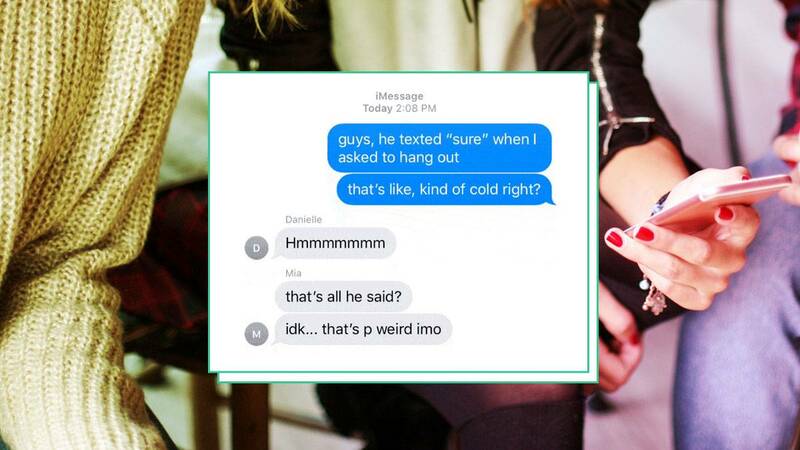 It makes sense that you'd want to send a confusing text straight to the group chat—you instantly have all of the receipts and none of the "well, you had to be there" nuances. As Dr. Theresa DiDonato, Associate Professor of Psychology at Loyola University explains: When you screenshot a text, "you have the ability to replicate the conversation [you] just had, so your friends can see exactly, word for word, the chat that just took place between you and your partner." At first, this seems foolproof. But there's one problem: "Text messaging is a really parsed-down method of communication that lacks subtlety," says DiDonato. "There are lots of ambiguous things said via text message because there’s no non-verbal behavior accompanying those texts." Looking at "k, see you later" can make it hard to detect if the person is actually enthusiastic to see you later, or passive-aggressively omitting exclamation points because they are annoyed that you said all craft beer tastes like expensive soap. Plus, you can't necessarily trust the feedback you're getting. According to DiDonato, people see their world through specific attachment lenses, and so someone's interpretation of a text could stem from how secure they feel in their own relationship, and have nothing to do with you. And, the thing is, if you send the squad multiple convos from the same guy trying to dissect his texting style, that already creates a negative impression of the relationship. "If you're burdening friends with requests to analyze conversations, it might suggest that you're more uncertain about the potential relationship than you are, which could influence the friends' perceptions of your potential partner," says DiDonato. Continually stressing over a new guy's emoji-less texting habits with your group chat might make them think there's a problem with him (even if he hasn't really done anything wrong). Of course, your BFFs can often see little warning signs in a relationship, like pointing out that you're the only one who initiates plans. Their ability to spot such potential red flags is undoubtedly very important. But there is a point where asking your group chat's opinions on your relationship can delve into something called excessive reassurance seeking. Dr. DiDonato explains this phenomenon as when "you need validation about yourself and potentially about your relationship too. It feels great to hear your friends say 'Oh, such a great guy! ', but if you need that constantly, then it could be a sign that you’re highly anxious.” Plus, unless the man is an unwavering jerk, your group chat of seven might have conflicting pieces of advice, which will only muddle your dating decisions. "People tend to be most satisfied with a decision when they have fewer options i.e., less decision regret, less decision uncertainty," says DiDonato. If you're already unsure about if you like a guy or not, crowdsourcing all your BFFs' opinions will probably not help you. So what can you do? Pick your go-to texters carefully. It takes a really great friend (or few friends) to view the situation clearly so you don't accidentally blow it with a great person because you think their ellipses is loaded with hidden meanings. "Choosing those friends wisely is important if you're thinking of disclosing something that could change their impressions of your partner or you, or your relationship," says Dr. DiDonato. Ultimately, your true best friends should and will be there for you when you legitimately feel stuck in a relationship and need addvice. And ideally, that's about all they should be involved in if you date someone long-term. "When you're in a relationship, a primary concern should be building relationship intimacy and closeness," says Dr. DiDonato. "Consider how you would feel if you wrote that text and your partner shared it with their friends—if it feels exposing, hurtful, or embarrassing, maybe it would better to keep that text to yourself." Great friends will absolutely carry you through bad breakups and fizzled out text convos. If you feel the overwhelming impulse to hit the home and power buttons every time you get a vague text, though, it could be a sign that you don't know what you actually want without consulting your BFF committee.